Lowest prices and widest selection anywhere for Genuine BB Battery Sealed Lead Acid Batteries. Replacement Sealed Lead Acid Batteries for UPS. 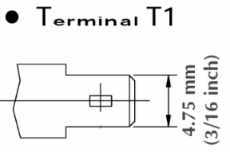 NOTE, the important issues are size and connector (terminal) style. 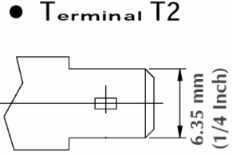 Make sure to open your UPS to find out how many batteries it contains, and the type of connector (terminal). 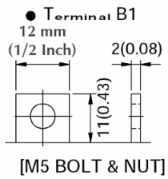 Terminal drawings are given below to help (click on picture for a bigger drawing). Several options are usualy available, including higher capacity and longer life. B&B Battery (also known as Best & Best Battery and BB Battery) is one of the premier sealed lead acid battery companies in the world. B&B Battery is one of only 3 companies that makes their batteries from raw materials, instead of assembling components purchased from other companies. This allows them to keep strict quality control over all aspects of manufacturing, and makes them very cost competitive. B&B makes private label batteries for many battery companies. B&B batteries are shipped as original equipment components by many of the world's biggest names in consumer and industrial equipment. These replacement batteries will meet or exceed the manufacturer's requirements. To order replacement BB Batteries, please call 801-764-9060 FAX to 801-764-9061, or go to our shopping cart.